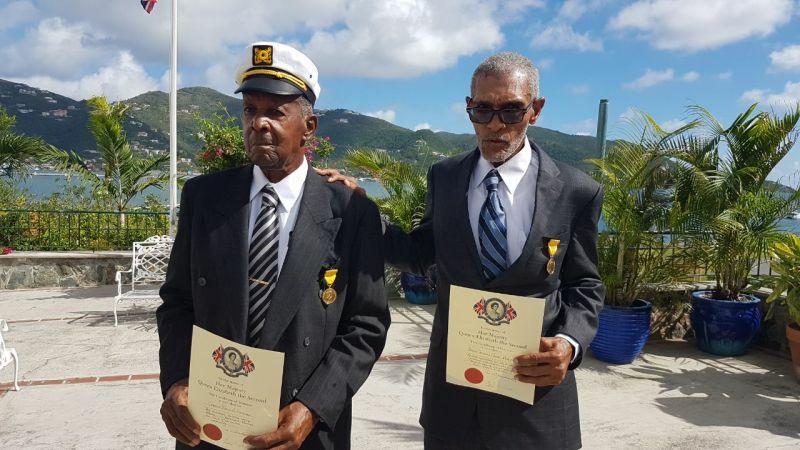 ROAD TOWN, Tortola, VI - At the BVI Badge of Honour investiture ceremony, two men were pinned by Governor Augustus J. U. Jaspert - Captain Wendel W. Parsons and Pastor Cromwell O. Hodge. 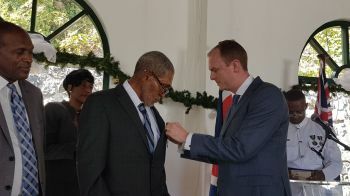 The ceremony was held at the Governor’s residence on Tuesday December 12, 2017 and also present to congratulate and celebrate with the honourees and their close families and friends were the territory's Premier and Minister of Finance Dr The Honourable D Orlando Smith (AL) and members of the BVI Honours Committee, including Mr Trefor A. Grant, who made a call for residents to submit names of persons they feel are fitting of such recognition. "Others in the community deserve similar tribute, help the honours committee to find them," appealed Mr Grant. He added that the idea of honouring those who went above and beyond their daily routine, giving of their time and talent without the thought of how much they would be receiving back, is remarkable. However, Mr Grant made a statement that should sink deep, "Let the older teach the younger to render patriotic service without saying a word." "Continue to be a bright beacon to those who are looking on, especially to our young people. Let's hope that they would grasp this whole concept of giving back to the society in which they live," he further stressed. Premier Smith, on the other hand, said his government is committed to supporting, uplifting and celebrating Virgin Islanders who give service to the community. 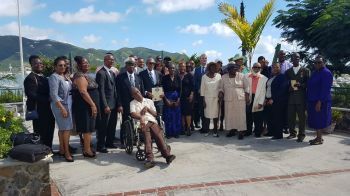 "In this spirit we are urged to give back and recognise those who give selfless to the territory," said the Premier, while noting that honourees have been putting country above self. Honouree Hodge is the brother-in-law of Premier Smith and brother of Minister for Communications and Works, Honourable Mark H. Vanterpool (R4), who was present as a sponsor. At the helm of the ceremony was Governor Jaspert, who did the honour of pinning the recipients, his first of such since taking up the seat as governor in August of this year. Adding credence to Mr Grant's remarks, Governor Jaspert said, "Our territory is populated with many individuals who give a great deal of their time and efforts in contributing to the continued growth and development of our beautiful Virgin Islands and its peoples. "I am pleased to say that it attests to the dedication and resilience of the people of the BVI and I see this strength shine through in the aftermath of events we have faced over the last months." 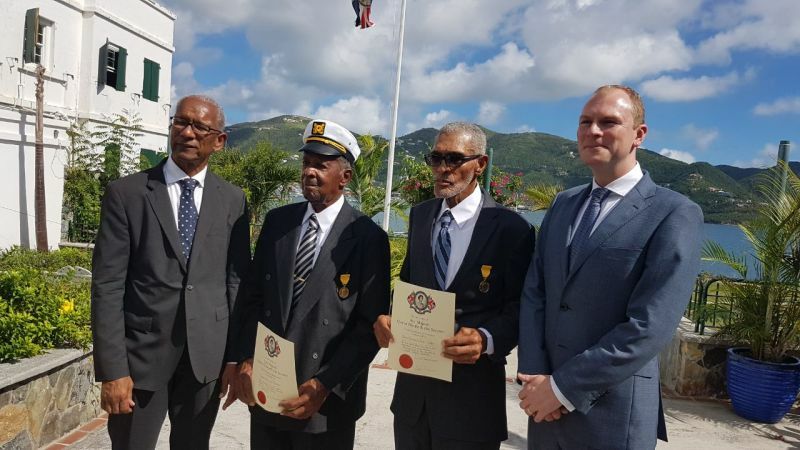 According to His Excellency, the two honourees are a testament of positive influences they have made in the lives of the people of the Virgin Islands. "The commitment and continued service that they willingly contribute to this community." Remember the government's launch, MV St Ursula? That's where Mr Parsons’ love for country above self is recognised and revered. He was the captain of that launch. Captain Parsons began service to the territory as a boat captain, performing the important role of transporting passengers between the islands. He was offered employment with the government back in those days to transport government officers between Tortola and the sister islands on MV St Ursula, the very boat which led Her Majesty The Queen' s party to the sister islands of Virgin Gorda on her first visit in 1966. He was later employed by government as a security officer/watchman for the government building which he did with pride until he retired earlier this year. He is a make of religion and faith and to this day provides faithful service to the Road Town Methodist Church as a member where he is a former treasurer of their men's fellowship department. Even more admirable is Mr Parsons dedication to caring for his differently abled son. For the past 17 years he has touched the lives of many in the community, visiting the sick and elderly even while caring for his son. Pastor Hodge takes the salute for being a man of the people and sharing the gospel of Jesus Christ indiscriminately. He served as the assistant pastor to Pastor Wesley Forbes as he helped with the establishment of several churches which were formed out of the Road Town Baptist Church, including Bethany Baptist in Long Look East End and Cane Garden Bay and eventually Road Town Baptist Church which is now the New life Baptist Church. The other side of this is the man who loved teaching and had a special passion for Civics as testified by several, including Deputy Governor Mrs Rosalie Adams. This is attributed to his passion for politics and socio economic development. Pastor Hodge, as he is fondly called, spent many years in the education system teaching several schools the Literacy and Skills programmes, Civics, Caribbean History and Religious Education. He not only had an interest in his students learning but also in their general welfare as he always encouraged them to excel and be responsible citizens and worship the Lord. Both honouree thanked all the people of the Territory for their award and while Captain Parsons was his usual simple and quiet self, Pastor Hodge had the audience in bouts of laughter as he returned gratitude telling those presence he cried twice: while telling his youngest son of his selection to be honoured and when receiving the official letter indicating same. Well deserved tribute to two of our finest. Doubly deserving is Mr. Parson for his loving commitment to Wade, his son. Weaker dads would have run off.